Ensure your surveillance system blends seamlessly into any environment with 4 dome cameras. The high-density black aluminum casing makes for a simple and clean installation with full-range 360° adjustability. Mount the on the ceiling for discrete monitoring at your home or business. Your security system is only worthwhile if you can actually see the person stealing from you. DEFENDER® dome cameras are equipped with 600 TV lines of resolution and an IR cut filter to enhance color and detail. The result is a clear, crisp and accurate video feed. Criminals don’t take the night off if it’s raining. Neither do our cameras. They’re weather resistant and ensure optimal picture quality no matter what Mother Nature decides to throw at you, be it rain, hail or snow. The professional-grade aluminum housing will protect against rust, deterioration and glare. No matter what’s going on outside, DEFENDER® will be ready. 4 x Dome Security Cameras, 4 x 65ft Extension Cables, 1 x Power Adapter, 1 x Four-to-One Power Splitter, Mounting Hardware, Quick Start Guide. 1 year manufacturer's direct warranty. 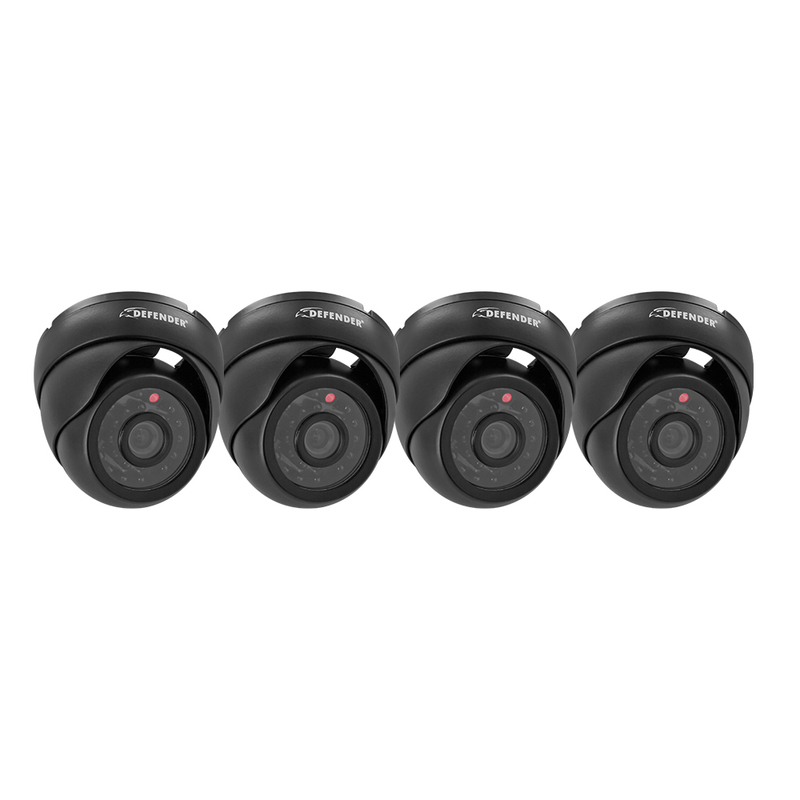 Bought these Model #21006 cameras as part of an 8-Camera system #21025 from Samsclub.com, and am happy with the overall performance of the cameras and DVR Model #21012 interface. Everything was easy to setup and program. The camera resolution is good day or night. I BOUGHT THIS CAMERA SET WITH A DVR & IT'S BEEN INSTALLED LESS THAN A YEAR. I'VE HAD TO REPLACE (3) OF THE (4) ORIGINAL CAMERAS. WHEN THEY WORK, THE SYSTEM IS GREAT, BUT WHEN IT DOESN'T IT'S AGGRAVATING. I've had these cameras for about 1.5 yrs now. The quality is OK, night vision range is accurate. However the night vision on one of the cameras has gone out. I have the cameras mounted externally underneath the soffits on my home, so they are not fully exposed to the elements. I would have giving these cameras 4 stars, but with the failing night vision I'm taking some away. I bought these a month ago and look forward to adding to my existing cameras system.